← Happy 2nd birthday, Protagonize! The longer Protagonize sticks around, the more I find it being mentioned in places that I never would have anticipated when the site was launched. I just came across this article on Psychology Today’s website via a recurring Google alert (which scours the web for mentions of the site on a regular basis) that I have setup. 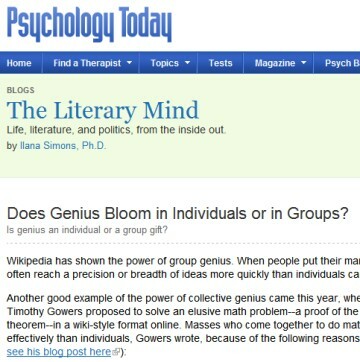 The article discusses how genius blooms in the individual vs. in collectives or groups, which I found very interesting. While the article only references Protagonize in passing, it was the context that intrigued me. First off, I’d like to thank Dr. Simons for the mention in her blog, The Literary Mind, and in what, as I understand it, is a very prestigious journal in its field. I also wanted to make a quick point about the nature of collaborative writing that may not come to mind for those who aren’t involved (whether as an author or editor) in creative writing on a daily basis. I completely agree that writing a collaborative novel, as per Penguin’s experiment a couple of years ago with A Million Penguins, is at best a challenging endeavour and is more often than not doomed to failure without the proper moderation and curation. On Protagonize, however, the majority of the writers who comprise our membership aren’t trying to write novels, per se — they’re exercising their writing skills and honing their craft, trying to build up experience and learn from other members on the site. Not to mention having a little fun in the process (I hope.) The goal of Protagonize (and many other collaborative writing sites online) is not necessarily to promote the creation of collaborative novels, but to promote the act of collaboration itself. The short-term goals, from my perspective, are primarily self-improvement and practicing, with other more distant or lofty goals such as getting published in some form or other, or building up a portfolio of work to use as reference material. I’d really love to hear what our authors have to say about it. While there’s no shortage of entertainment and good fiction available on Protagonize, I’ve never thought of it, as it stands now, as primarily a novel-writing endeavour. This entry was posted in Collaborative writing, General, Press and tagged Collaborative writing, exercise, fun, literature, Press, psychology today, publications, writing. Bookmark the permalink. Agreed. 1102%. I think it’s the same reason people seek out friends or groups to jog with. Protagonize really opened a whole new venue of writing for me – I instantly realized through the provided chances for collaboration that it wasn’t the goal of a novel, but the fun in the creation of it. During the process, with something so new and per say, “foreign” in concept, I reflected upon the forms of collaboration taking place and realized that it is an amazingly fast and effective form of writing practice and improvement – there is no time to dawdle about the ending and fine detail of a novel, only room for learning how to work with a group of diverse-minded people. The writer, if aware of the equal parts that they are playing in the collaboration, has to get over any writer’s block/apprehensions while simultaneously reigning themselves in (from any far-off, individualistic ideas), in order to write comprehensively, and create a voice that fits within the story. And if one is writing with awareness, no doubt through those conscious collaborations, there will be vast improvement from lines A to C – and from there one can apply new skills towards more lofty work, like a novel. and..um…Psychology Today uses Georgia and Helvetica too? That’s awesome, Nick! I have a feeling that, in a couple of years, Protagonize will be legendary. I agree wholeheartedly with what you’ve said – I think very few members of the site have participated in a collaborative story with the goal of completing a novel they’d have published. But I know that working with other authors has helped me so much, with everything from plot ideas to character development. That is Stupendous Nick! Having your brain child publicly acclaimed has got to be truly self affirming. You done gone Nick. I am sooooo proud of you and your creation, Protagonize! A year and a half ago I would never believed that I was capable of writing a novel, but I’m doing it! I got it started in November for NaNo with my 50,994 word entry, but I’m finishing it and posting it on Protag as I go. I will finish, I know I will. If I hadn’t found Protagonize, what little talent I may possess would have remained buried in bits and pieces of scribbles in my den table drawer. I imagine that a huge number of the other Protagonizers would not have explored or increased their writing skills had you not developed this amazing site. Thank you so much for bringing out the writer in me, Nick. Primarily a novel-writing endeavour? Definitely not. An opportunity to stretch your writing muscle, to write things you never would have otherwise, to simply improve? Absolutely. Can it be used as a place to collaboratively write a novel? Without a doubt. I’d suggest that this exact thing is going on already and will only grow once Groups go fully, completely, really for reals live. For fun, for feedback, for improvement… for showing your work to more than just family and friends… Protag is all of these. And so much more. Congrats on the mention in the article Nick. Promise to remember us little people when you’re rich and famous. I’m not saying every story on Protagonize is a gem, but there are plenty that are better than some of the garbage novels that get movie deals and the like these days (*cough* glittering vampixies *cough*). Hello. I am 66. Along my live I tried up twice to wite down a novel. I failed becuse I don’t have any “literature roundness” that only a true novelist could endow. This happens in Spain. Now I am looking for such a man there that puts his name to the finish efort to mend it and complete as for himself.There are 200 usefull pages and need 500. Is it so difficult?. The last novel is placed at 2010 and a elaborate issue of new social order based in job post sharing on bases of limited time and adquired by challenging or non convincing methods is, as background to the argument, well sketched. I want to give it out and colaborate with willing author to his service. My residence is in Madrid. Thanks to the opportunity laid by this web. Sorry. I meant 2100, no 2010, but is not fiction science. Sorry it looks I meddled in what looks a blog for specialized young writers, a little bit pretentious on my side? The point that agrees sideways with the Penguin experiment, but in real version, it has to be cases like mine. Thousands of people write down on paper daily incidents that troublesome their lives mainly on their work places. They want to do something about it, and some do it compiling as in a stereotype novel (each day enlightens a different chapter). While this exercise sooths your live, at the same time you dream that someday will be a complete novel that will transmit to the world a piece of your mind. It is not so easy. But as I said yesterday, twice in my life I wanted to “share” to the world some solutions that I thought opportunistic from the little knowledge that I myself extricated from my profession mainly, (Systems Logicians) regardless than that “deviated” look was right or wrong to others (I don´t say, that even may be wrong by itself). (Let allowance to the fact but it won´t look wrong to the readers that gulp down anything written on paper). The first distressed novel back in the 80’s it doesn’t come to the point because the “phenomena” is now resolved and so, is obsolete. But as I say one writes about what things transcends to their daily boring tasks and sublimate ideas for higher order. That is my case that I wrote along years and years in my second unfinished novel of “new social order”, based in job post share for honest workers at the future. That and what surrounds that world at medium future it had to be the work of at least two visionaries to write, as I came to call out, as if for chance. [aryst0krat ] ahh, I thought the idea of Vampires with diamond skin was actually quite novel… (ooh a pun) other than that I’ve not read the books but the movie’s were grade A merch material. nothing else.